The Mayor and Mayoress of the Borough of Melton, councillor Tejpal Singh Bains and his mother, Mrs Rajbinder Bains are inviting people to join them at the annual Civic Sunday service next weekend. The civic service, held at St Mary’s Church, Melton, is one of the traditional engagements in the Mayor’s calendar celebrating community spirit and public service. The formal service, led by the Rev Kevin Ashby, will take place on Sunday, March 4, at 3pm. 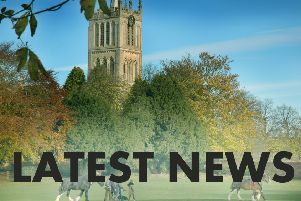 A retiring collection will be taken and divided between St Mary’s Church and the Mayor’s chosen charities - LOROS, and the East Midlands Branch of the National Rheumatoid Arthritis Society. All faiths are welcome and a reception will be held immediately afterwards in the church. Cllr Bains said: “The church and council share similar aims in our community roles, and this service is about the commitment of the Mayor, councillors and the council to serve the people of the Borough of Melton. It is also about service to the community in a wider sense. Guests will include the Lord Lieutenant of Leicestershire, Jennifer, Lady Gretton, the chairman of Leicestershire County Council and other dignatries from councils across Leicestershire and neighbouring authorities. Representatives from other charity and voluntary organisations that serve Melton and the wider rural communities have also been invited.